It is estimated to have cost 60 million euros to build. Initial groundbreaking work on the bridge began in June 2004. 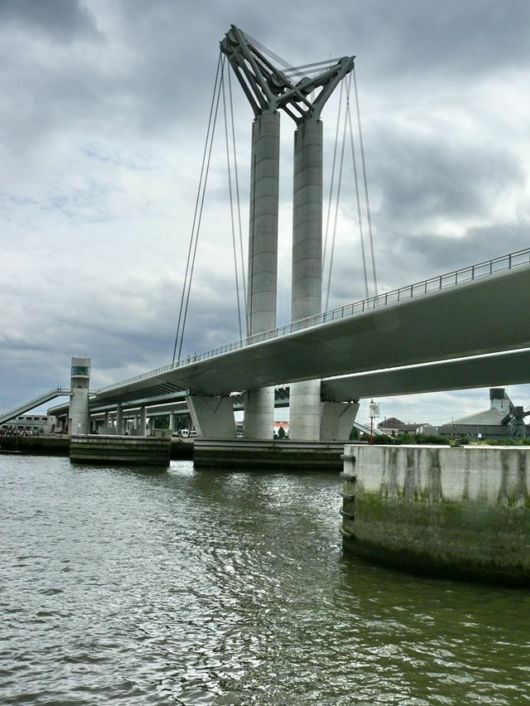 The Rouen city council chose the bridge’s name on December 15, 2006. 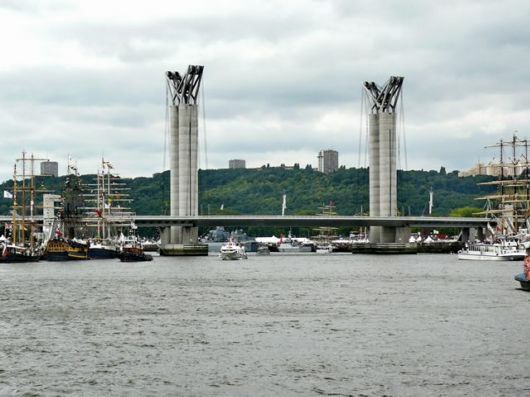 The bridge is named after famous 19th century novelist Gustave Flaubert who was born in Rouen. The bridge is on the connection between the Normandy motorway (A13), via the RN338, A150 and the motorway which connects with the A29 and A28. 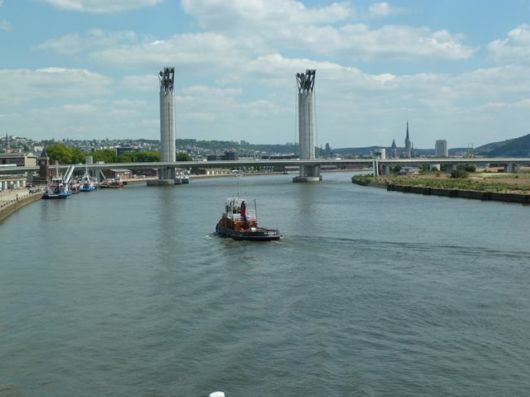 This link should help relieve the western districts of Rouen while providing the necessary liaison with the economic zone and the port of Rouen. Two time of passage of this bond were studied: time providing for the crossing west of the Seine west of Grand Quevilly Time is passing east of the Grand and Petit Quevilly Quevilly. The western zone was abandoned because of its hills and forest in its path. The time is was chosen because it allows a transition to closer neighbourhood centres of Rouen. 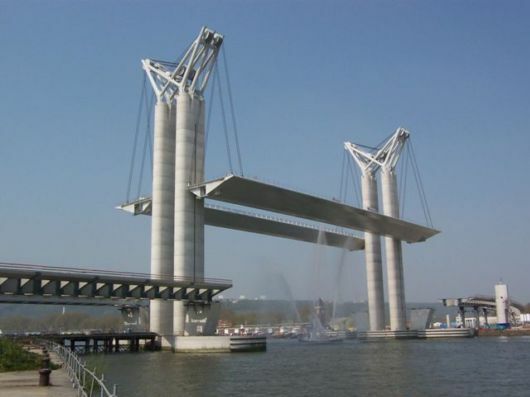 Several types of structure are possible to cross the Seine while retaining the possibility for larger boats to access the port of Rouen. 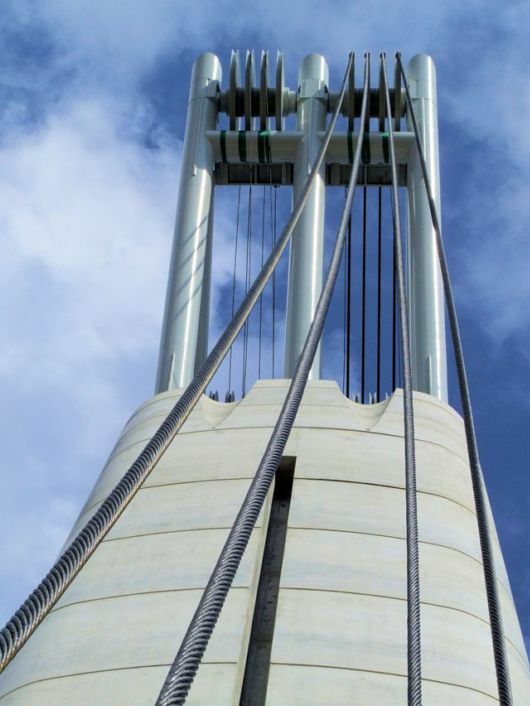 Fixed bridge gauge sea: it is necessary for this type of structure to provide a template of 55 metres in height above the highest navigable water (PHEN). Its urban integration becomes difficult, especially if one wants to limit the slopes of the viaducts, it is not possible to provide interchanges with ways on bank near the bridge. This solution was used to cross the Loire to Nantes for Cheviré bridge. River tunnel: this solution is expensive – for its construction and operation – and poses security problems for the passage of hazardous materials. Moreover, it is difficult to predict exchangers near the banks. This solution was made for the tunnel in the Old Port of Marseille. fixed bridge river gauge: this solution limits the size to 7 metres high. But it no longer allows access to cruise ships in the heart of the city and organise sailing events of the type Armada. These various solutions have led the client to study a book mobile for the passage of large boats only need 20 to 30 times a year. This type of structure is required to meet the template river throughout the year and the template for the few maritime passages of large boats. a bascule bridge: but this is a problem of implementation support in the Seine to avoid having too large spans. 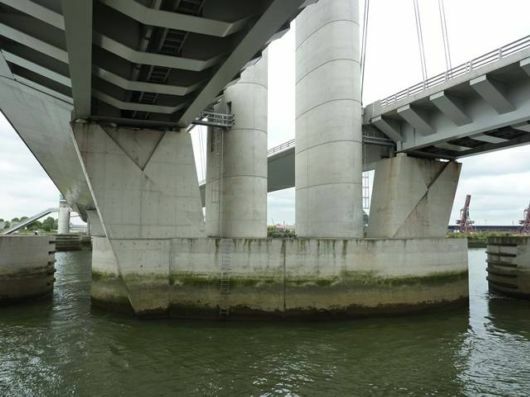 This solution was chosen for the lift bridge Seyne-sur-Mer or Tower Bridge. a swing bridge which has the disadvantage of a linear neutralising important platforms and requires their reinforcements. This is a solution that was taken to the bridge Caronte. a lift bridge. This solution requires the realisation of high-rise towers on both sides to release the template sea. This solution reveals the different constraints on the closer. The lifting of the centre span needs to cut traffic. 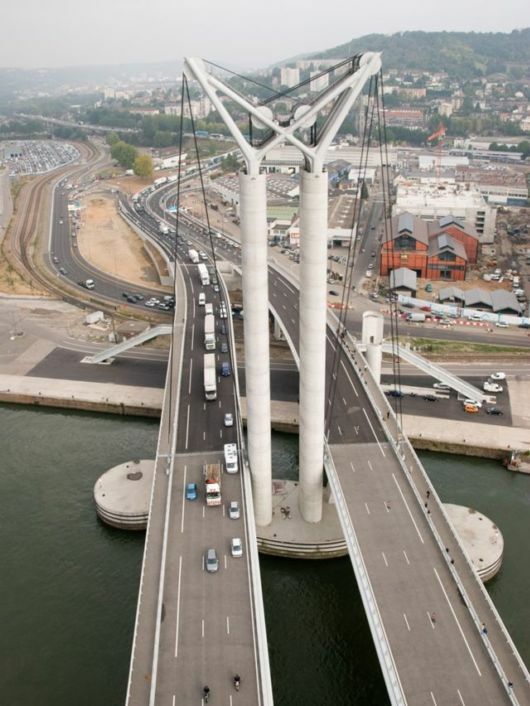 This is the type of structure implemented in Brest for Recouvrance bridge. This is the solution finally chosen. At its feet on the right bank, is an old port area undergoing rehabilitation, which includes among others the Maritime Museum and on the left bank, a brownfield site which should result in a large real estate transaction. 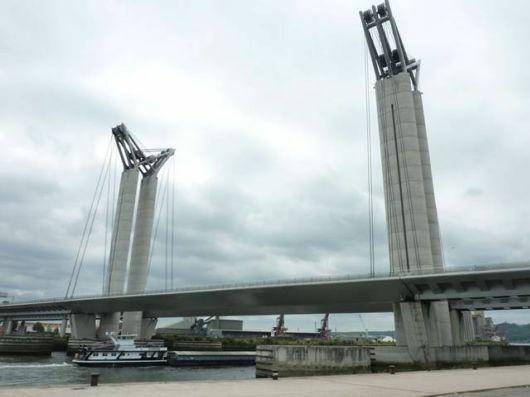 This is a lift bridge with a span of 120 m and a total height of 86 m, the third tallest building after the Rouen Cathedral and the Tower of Rouen archives. The air draft is 7 feet when the deck is in the down position, consistent with the passage of barges, and 55 m above the Seine in the upper position. Its features make it the highest lift bridge in the world. It links the A150 north (towards Barentin / Dieppe) to the ring road south of Rouen, which joined the Normandy motorway. 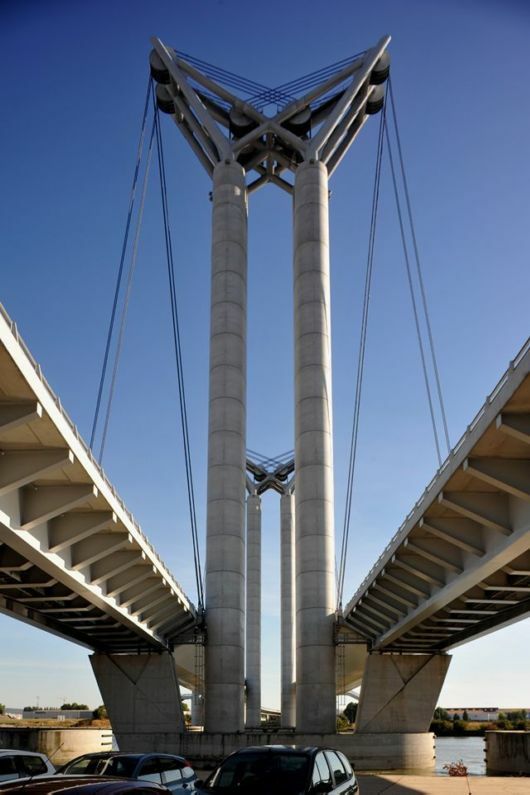 Its total length, including viaducts, is 670 m.
The dual deck, each of which is 120 m long and weighing 1,300 tons, is supported by four pylons (arranged in pairs) located in the bed of the Seine. It gets up in twelve minutes, according to forecasts on average thirty times per year, particularly to make way for the sailing of the Armada in Rouen who return periodically and cruise ships that dock in the city centre (near terminal Bridge William the Conqueror). 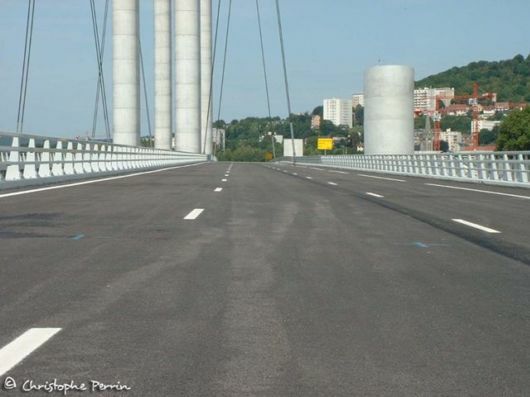 The market for construction of the bridge is mounted without the viaducts, 60 million euros. 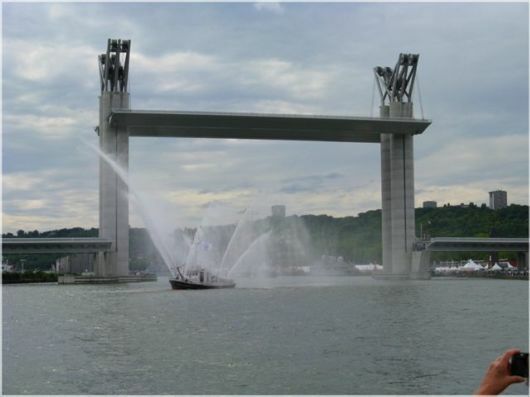 It was won in February 2004 by a subsidiary of the Bouygues Group, Rouen society Keel, in association with Eiffel, Eiffage Public Works and the Belgian firm Victor Buyck. The total cost of the operation, with access road, is 137 million euros. The declaration of public 20012 of September. Work began in June 2004. The installation of “butterflies” at the top of the battery was held on 16 and 17 August 2006, the apron 21 and August 22, 2006. 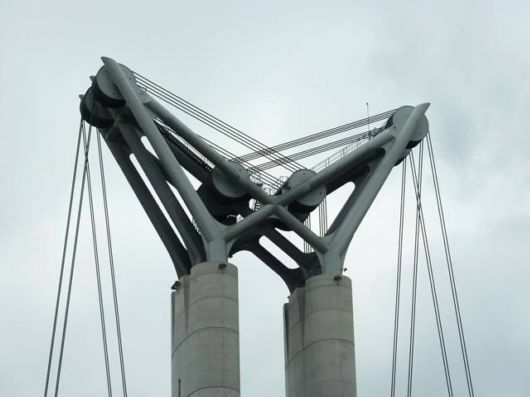 The design team, which was representative engineering firm Arcadis, included the engineering Eurodim, specialist machinery and Aymeric Zublena, one of the architects of the Stade de France, and Michel Virlogeux, designer Normandy Bridge and the Viaduct of Millau. The projected traffic is estimated at 50,000 vehicles per day. It is supposed to rid the downtown quarter of 190 000 trucks daily cross the fleuve. 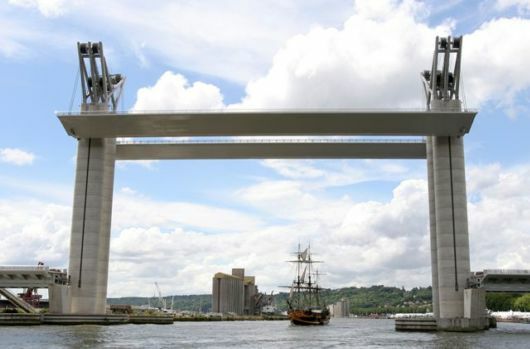 Front View, at the 2008 Armada Its name, in homage to the writer Gustave Flaubert, was finally chosen December 15th, 2006 by the City Council of Rouen, after consultation of the people have to choose between this name, Bridge or Bridge Rouen La Salle ( for the explorer La Salle). Until then, it was temporarily named the sixth bridge. 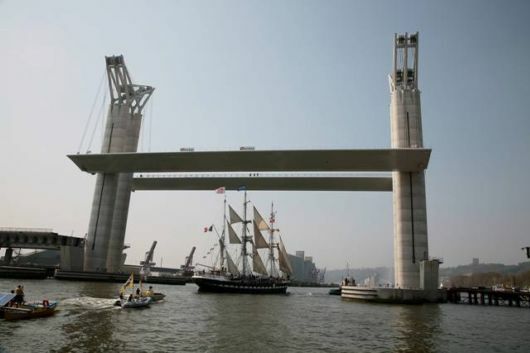 On 14 April 2007, the barque Belem, docked for a month, went under the bridge Flaubert, after initial tests allowing it to rise enough to let him pass. A crowd of Rouen had then made an appointment to cheer the event.